Langtang is a narrow valley situated just south of the Tibetan border and populated with Tibetans and Tamangs, who share a similar religion, language and clothing. The landscapes we cross are extremely varied: rice-terraces, gigantic rhododendron and fir forests and, at altitude, a rock and shrub wilderness against a backdrop of snowy peaks. The crossing of Ganja La pass is a high mountain itinerary and sometimes requires the use of ice axe and crampons. After the pass we reach the Helambu valley with its numerous and colorful Sherpa villages. Option: From Kyangin Gompa, with one or two extra days, you can ascend the Yala Peak (5500m) or the Tsergo Peak (5750m). Day 03: Kathmandu - Dhunche (1950 m) by bus. in 5 h. This is a fine day of trekking, which traverses fir tree and rhododendron forests towards a ridge (2300 m). From here we get a panoramic view all the way from Ganesh Himal in the west to Naya Kanga in the east and the Tibetan snowy summits. The trail drops steeply down towards the Bothe Khosi River towards Syabru. A busy village with its houses laid out in single file down the hillside. 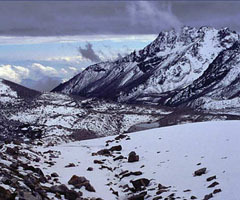 Sherpas and Tamangs farm this area. in 5 h. Following a high trail, we pass through terraces and bamboo massifs. We cross Syarpagaon to continue through a fine forest, alive with birds and the occasional troupe of monkeys. After crossing the Langtang Khola, we start the ascent of the valley and soon reach the few shepherd's huts of Lama Hotel. in 5 h. We now have a spectacular view on the Langtang Lirung (7246 m). After a steep climb through the Langtang gorge, the ascent eases and the valley widen out into an area of yak meadows and rhododendrons. Further up, we reach Langtang, populated by Tibetans. in 3 h. An easy and pleasant walk through the yak meadows. The village is spectacularly situated in a glacial amphitheatre dominated by high peaks. An excellent base for side walks towards the Langtang Lirung glacier, eastwards to Lagshisa glacier or a tougher ascent of the northern flank of the valley towards Yala Peak. or Tsergo Ri (4980 m) ascent. With two or three extra days, we can organize the Yala Peak (5500 m) or Tsergo Peak (5750 m) ascent. in 5 h. Climb up through a rhododendron forest and junipers towards Ngegang yak pastures. Keldang (4300 m) in 5 h. The ascent to the pass is quite tricky, following streams at first, and continuing through snow and rocks. We scramble the last 100 meters on a steep and snowy slope. The pass offers an impressive panoramic view of the Langtang Lirung and the snowy summits of the Tibetan boarder, amongst rises the Shisha Pangma (8013 m). Then, the trail steeply plunges through moraines. in 6 h. Ascents succeed to descents along the ridge trail. in 5 h. We reach a pass towering at 4080 meters, offering a great view throughout the Himalaya. We now start our descent towards Helambu through fir tree and rhododendron forests. in 5 h. The ridge trail crisscrosses streams and waterfalls, and offers wide views in all directions with the southern foothills of Nepal fading towards the plains of India. in 4 h. A knee-wobbling journey as altitude is rapidly lost descending to the Melamchi Kola River. Day 15: Melamchi Pul - Kathmandu (5h) by bus. Day 16: Kathmandu. Day at leisure. Safety day for your international flight. Day 17: Kathmandu. Hotel - airport transfer.